GMR is an International peer-reviewed, all-electronic journal available at no charge to readers via the Internet. What are GMR's aims and scope? 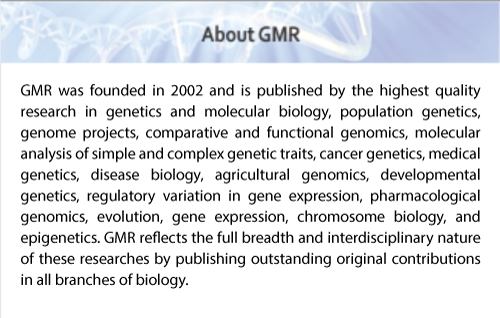 The overall aim of GMR is to publish original, outstanding research papers in the areas of genetics, molecular biology, and evolution. GMR has been launched to streamline the process of publication and to make these publications readily available to the scientific community. The editorial staff at GMR maintains the same structure and procedures of the print journals it has worked with previously, but with reduced costs due to elimination of printing and mailing processes. Further, lead time to publication is considerably reduced. After extensive consultation with scientists, financing institutions, and indexing agencies, we concluded that there was a need for a high-quality electronic journal accessible at no charge to anyone, anywhere, at any time. Is GMR a “real” journal? Absolutely. GMR publishes original research articles that have undergone rigorous peer review. Citations to GMR can be made as to any print journal. The Journal publish quarterly issues. GMR is committed to maintaining unrestricted access to the archive at no charge in perpetuity. GMR is presently abstracted and indexed in the following secondary services: Abstracts on Hygiene and Communicable Diseases, AgBiotechNet, Agricola, Agricultural Economics Database, Agroforestry Abstracts, Animal Breeding Abstracts, Animal Science Database, Apicultural Abstracts, BioDirectory, Biological Abstracts, Biological Sciences Abstracts, Biosis Previews, Biotechnology and Bioengineering Abstracts, CAB Abstracts, CABI Animal Production Database, CABI Crop Science Database, CABI Plant Genetics and Breeding Database, CABI Tropical Diseases Bulletin, CABI Veterinary Science Database, Cambridge Scientific Abstracts, Chemical Abstracts, Crop Physiology Abstracts, CSA Biological Sciences, Dairy Science Abstracts, Directory of Open Access Journals, EBSCO Publishing, EMBASE, EMBiology, Entomology Abstracts, Environmental Science Database, Excerpta Medica, , Field Crop Abstracts, Forest Science Database, Forestry Abstracts, Genetics Abstracts, Horticultural Science Abstracts, Index Medicus, ISI (Science Citation Index Expanded), Lilacs, Med Bio World, Medline, Nematological Abstracts, Neurotransmitter, Nutrition Abstracts and Reviews Series A, Nutrition and Food Sciences Database, Parasitology Database, Pherobase, Plant Breeding Abstracts, Plant Genetic Resources Abstracts, Plant Protection Database, Protozoological Abstracts, Review of Agricultural Entomology, Review of Medical and Veterinary Entomology, Review of Medical and Veterinary Mycology, Review of Plant Pathology, Rice Abstracts, SCD UHP-NANCY, Scirus, Virtual Health Library, Weed Abstracts and Wheat, Barley and Triticale Abstracts. How do I benefit as a GMR author and why should I submit my best papers? The editors are dedicated to establishing GMR as a prestigious publication, and authors benefit from this commitment to scientific quality and visibility. The very nature of the articles published in GMR ensures that the journal will have high impact and attract extensive citation. Funding agencies, tenure committees, and promotion boards will recognize GMR in their considerations and decisions. Authors benefit from the high visibility of publishing their papers on the GMR website, and from the speed of the publication process—peer-reviewers will be asked to review papers within 30 days, and papers will be published online as soon as they are accepted, incurring little in the way of postal or printing delays. Authors can include links to their published GMR articles on their personal or departmental websites, and in messages to colleagues, informing them of publication. They will thus avoid postage costs and delays in availability of their material to interested readers. How does GMR take advantage of the Internet? GMR takes advantage of web publishing in several ways. Articles are published as soon as they are accepted, rather than waiting for completion of an issue. Authors can present data and results that could not readily be presented in print journals. These include color figures with no extra charge. In addition, authors can supply hypertext links to other resources, such as supplementary material available elsewhere on the web. Yes. We are aware of the need to provide secure data storage for future archiving of material. Our own web server is extensively backed up, and we are committed to providing access 24 hours a day, 7 days a week. Can articles be printed out? Yes. Articles appear on the web as html documents, which are easily viewed on a computer screen, or as PDF (Adobe Acrobat) documents, which are formatted as in a normal print journal and can be printed as such with the corresponding page numbers. How are GMR articles cited? Duarte FAM (2002). A new, online genetics journal. Genet. Mol. Res. 1:2-5. For papers published in 2016 and after, GMR has adopted a new format without page numbers. Please note the correct way to cite current and future GMR published papers. Page numbers have been replaced by a portion of the DOI number.